This page concentrates on shoes from a competitive perspective. 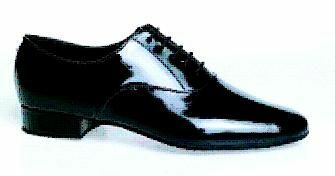 For more general information on dance shoes also see here. Dancing shoes are different from normal shoes: they have suede soles, are more flexible, and offer support where you need it most. 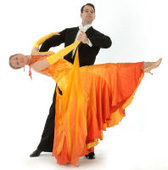 If you intend to dance long-term or compete regularly, it is worth buying a pair. There are many companies selling dance shoes and it can be difficult to know what to get - hopefully this page will help. 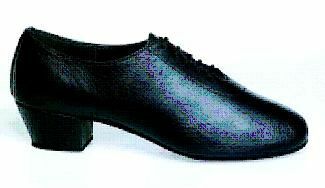 You can get Modern (Standard) and Latin shoes. However, if you are only going to buy one pair, I recommend getting Modern shoes as you can dance Latin in Modern shoes but not vice versa. You too, can get Modern and Latin shoes. However, if you are only going to buy one pair, I recommend getting Latin shoes as you can dance Modern in Latin shoes but not vice versa. 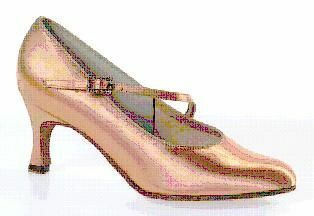 Latin shoes are often sold as 'Sandals' and Modern shoes as 'Court'. Men: if your shoes are not black, they will not match your trousers and your feet will create attention. This isn't good, even if you have really good footwork. If your Modern shoes aren't shiny (patent), it gives the impression that you're unsure of what you're doing, whereas shiny shoes exude confidence. Ladies: if your shoes are not flesh- or tan-coloured, your shoes will not blend in with your (tanned) legs, making them look short. Ladies: there are inevitably far more options for shoe styles than there are for men. Much of it is personal choice (as long as you stick to the rough pointers above). With Modern shoes, you often have the option of a strap across the front. This is entirely up to you although some women find it helpful in keeping the shoe on. 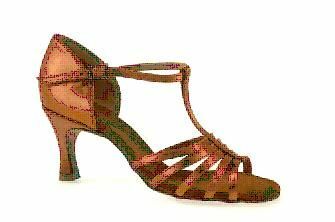 For Latin shoes, you can get them with a solid band across the toes or strappy (like the one in the picture), or you can get them with or without a T-bar. Again, this is entirely up to you.